Do you find yourself hearing the term zero carbon homes but not really knowing what it means? Parsing terminology can be confusing at times, so we’ve put together a little explainer on what exactly is a zero carbon home, why we need them, their typical features and benefits and the latest on UK government policy. Climate change: Over 190 nations signed up to the historic Paris Agreement on climate change in December, to limit global temperature rise to below 2C (bearing in mind we are already half way to that limit!). Nationally, the UK’s Climate Change Act of 2008 requires by law that we reduce carbon emissions by 80% by 2050, compared to 1990 levels. As 37% of UK emissions come from buildings, zero-carbon homes have a huge potential to help us meet these challenging targets. Fuel poverty: There are 4.5 million households in ‘fuel poverty’ in the UK – meaning they have to spend more than 10% of their income on keeping their home at a comfortable temperature (defined as 18-21C). There are three relevant factors: energy efficiency of the home, energy costs, and household income. As a whopping 96% of fuel-poor homes are poorly insulated, energy efficiency is clearly an area that can make a big difference. Of course, families and individuals that are not in fuel poverty will still benefit from more efficient homes and lower utility bills. Clarity: While climate change and energy costs/fuel poverty are the main drivers, a secondary point is that ‘zero carbon’ gives us a common goal which is clear and ambitious. In contrast, a term like ‘eco home’ is vague and can be used to describe an off-grid earthship and also a conventional flat with wall insulation and LED lights. Open plan living room of our multi award-winning zero-carbon home. Although a lot clearer than ‘eco home’, the term is actually not quite as crystal clear as it could be. You might think zero carbon home means a home that emits no carbon – but it’s not quite as simple as that. 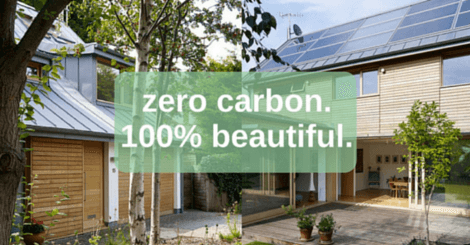 In this article, we’re talking about zero carbon homes as they are defined in the UK. While much of the information will be relevant to other countries, you should check for differences in policy and definitions. They are net-zero, not absolute zero. That means they do actually emit some carbon emissions, but they offset them – usually by generating clean green energy. Only emissions during occupancy are counted. This means the embodied emissions in the materials of the house and the construction phase are excluded. b) because this has more to do with people’s behaviour than the quality of the house. The zero-carbon standard doesn’t need to limit design. Contemporary to rustic – it’s all possible without carbon. 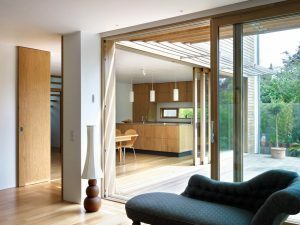 While being as diverse in form and style as any conventional house, zero carbon homes always make use of energy efficient and passive-solar design features, and very often (though not always) use renewable energy technologies. The zero-carbon standard doesn’t need to limit design. Contemporary to rustic – it’s all possible without carbon. By far the easiest and most cost effective way to reduce carbon emissions and energy bills is to reduce the energy demand. This means making a building more energy efficient – done either at the design stage or later as a retrofit. Large south-facing windows with sun louvres, thick air-tight walls, high levels of insulation, low-flow taps and LED lights are some of the most popular features for energy efficiency. The Energy Saving Trust has lots of useful resources and tips. Once energy demand has been minimised through efficiency measures, the next stage is to generate the required energy with renewables. The first renewable technology householders usually opt for is solar thermal – panels on the roof which use the sun’s warmth to provide domestic hot water for baths, showers etc – as it is the most affordable. Solar PV (photovoltaic – panels that generate electricity) is also very popular, and their cost is falling at an impressive rate. Biomass boilers and air-source heat pumps are also common, to a lesser extent. Other technologies such as wind turbines or hydropower are hardly ever used domestically, but could potentially be appropriate for very large rural properties. Passivhauses – a stricter type of zero-carbon building – usually don’t have any renewable technologies because they are so incredibly energy efficient that they don’t need any heating or cooling! In contrast, some properties that cannot reasonably install renewables (such as inner-city flats) can achieve the zero carbon standard if the developer offsets the emissions off-site with ‘allowable solutions’ – usually by investing in renewable energy elsewhere or retrofitting other buildings. Kitchen-diner of our multi award-winning zero-carbon house – with south facing sliding-doors. The transition to zero carbon homes in the UK has suffered a major set-back in terms of government backing, but is nonetheless gaining in popularity and gradually becoming more mainstream. In 2007, a UK government policy statement announced that to combat climate change all new-build homes would be zero carbon by 2016. A year later, the Zero Carbon Hub was set up to handle the practical implementation of this ambitious policy. However, the policy was scrapped in 2015, ostensibly to encourage faster housebuilding, which we are yet to see. The Zero Carbon Hub ceased operations in March 2016, although at the time of writing their informative website is still online. Replacing the Code for Sustainable Homes, the new Home Quality Mark is a holistic and optional standard for new builds which covers economic, health/wellbeing and environmental factors. A home does need to be net-zero carbon to get full marks on the environmental section, and the Home Quality Mark also includes the embodied emissions in construction and materials, and even local ecology. However, as a voluntary ‘high quality’ standard, competition is the only thing pushing developers and house buyers to go zero-carbon, and when housing is in such high demand, that’s unlikely to be enough. As time goes on and pressure to meet climate targets increases, we predict that zero carbon homes will continue to rise in popularity and will become at least as common as they are in continental Western Europe. There’s even been talk of taking whole cities zero-carbon, which may seem a long way off today, but it is surely our future. 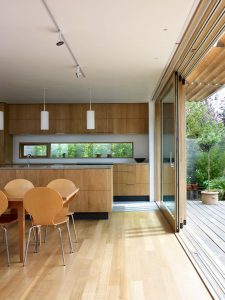 Back in 2010 we built a zero carbon home and office which has since won two awards: the RIBA Download Prize of 2011 and the Green Apple Built Environment Award in 2016 (Gold). The energy demand is half the national average, and solar panels and a biomass boiler produce 100% the energy required – exporting a surplus back to the grid and bringing in a net income from renewable energy incentive schemes. To give people a good idea of what’s possible and how we’ve achieved this, we have put together a 10-page case study which is free to download as a PDF when you sign up to our monthly Koru Eco-Design Newsletter. So, would you like to live in a zero-carbon house, or do you already? Tweet us at @KoruArchitects!